Tag Archives for " Salomon Wancier "
1	Equity Crowdfunding: Your Solution for Small Business Financing? Thursday is guest post day here at Duct Tape Marketing and today’s guest is Salomon Wancier – Enjoy! Small businesses haven’t had it easy since the dawn of the recession in 2008, but thankfully they’ve enjoyed a steady (if slow) recovery. Recent studies show that 2013 was a solid year for small businesses and 2014 should be even stronger. 89 percent of small businesses increased travel between fall 2013 and the previous year. Small businesses created 102,000 new jobs in November alone. And eight out of 10 small business owners plan to increase their products and offerings in 2014. But in order to travel, add personnel, and execute on expansion plans in the coming year, many small businesses will need financing… which is where things get tricky. Despite being the strongest drivers of growth in the U.S. economy, small businesses face immense challenges garnering funding from traditional sources like venture capital firms, angel investor groups, or debt financing. Since small businesses aren’t the only ones struggling for financing – startups, entertainment projects, musicians, and others face similar challenges – the new (and popular) crowdfunding industry has increasingly filled the funding gap. In a crowdfunding campaign, a group of individuals pools resources to support a company, organization, artist, or project. 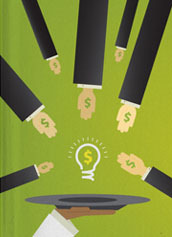 Crowdfunding has become a viable way for many entities to raise money. Over $480 million was pledged to campaigns on Kickstarter (the best-known crowdfunding platform) in 2013. But unbeknownst to many, there are four different types of crowdfunding taking place on various platforms: Rewards, Donation, Lending, and Equity. Rewards campaigns exemplify “traditional” crowdfunding on platforms like Kickstarter. In exchange for some reward – a discount, freebie, product pre-order, or other item – individuals contribute money to an organization, project, or company. Donation campaigns are mostly the same, except there’s no physical reward element – just the reward of giving to a worthy cause. In Lending crowdfunding (or “peer-to-peer lending”), individuals loan money to businesses or people at competitive interest rates. Then there’s Equity crowdfunding – the next phase of the crowdfunding phenomenon and the type arguably best suited to business financing. In an Equity crowdfunding campaign, individuals aren’t backing a project in exchange for rewards; they’re investing in a business. In exchange for contributions, Equity crowdfunding investors receive ownership interest in the entity raising funds – just as would an angel investor or venture capitalist. Under current regulations, Equity crowdfunding opportunities are only available to Accredited Investors. When the SEC implements rules for Title III of the JOBS Act, the general public will also be able to invest through equity crowdfunding. Several factors make Equity crowdfunding a fit for small business financing. The first is marketing. A crowdfunding campaign (of any kind) is a unique marketing opportunity. Executing a successful campaign requires business owners to promote their companies to new audiences – increasing overall visibility in the process – and motivate their existing networks to support them. Before launching any online fundraising campaign, be prepared to become your business’ biggest cheerleader. Additionally, Equity crowdfunding is designed to finance companies and other long-term ventures – unlike Rewards or Donation campaigns, which are often best suited to individual projects. (Kick-starter only posts campaigns for “creative projects.”). Rewards crowdfunding facilitates a limited arrangement between business and backer. Once a project owner delivers the rewards, the relationship between backer and business ends. Equity crowdfunding, however, establishes a long-term relationship between the crowdfunded company and its supporters – one in which both parties have vested interests in achieving success. Equity crowdfunding investors are likely to patronize and evangelize the company they invest in, since that will help the business earn them a return on their investment. Which is not to say that Equity crowdfunding is a sure thing. Like any investments in small businesses and early-stage companies, Equity crowdfunding investments are high-risk. And not all Equity crowdfunding campaigns end in successful financing; some companies are bound to fail. But though Equity crowdfunding is still evolving, it has the potential to be rewarding for certain small businesses and investors. It’s the next logical phase of crowdfunding, it’s the future of investing and financing, and perhaps it’s even the way your small business will fund a promising 2014.